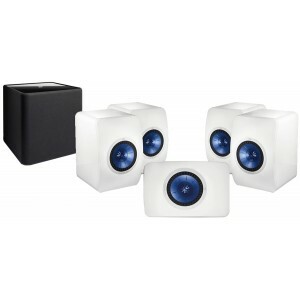 This cost effective and practical KEF 5.1 package includes 5 LS50 speakers in white; a pair for the fronts, a pair for the rears and one for centre along with a Kube 2 subwoofer. One of the best loudspeakers released in recent years, the KEF LS50 has won virtually every award possible including the What Hi-Fi 'Readers Award' in 2013 and 2014, 'Best Standmounter' of its price range in 2012 and 2013 and 'Product of the Year' 2012. KEF LS50 50th Anniversary speakers are innovative and professional designed to bring recording studio quality to your home in even the smallest of spaces. Rarely found in such a compact design, the LS50s deliver a rich, multi dimensional soundstage experience, filling the room with equisite sound far beyond the conventional performance of similar sized speakers. The KEF Kube 2 active subwoofer delivers a well defined and impressive bass that is sure to rock your home cinema experience. The integrated 200W Class-D amplifier has all the flexibility you need for personalising the output with frequency and level adjustments as well as a ‘Bass Boost’ control catering for your personal preference or room specific conditions. The KUBE-2 features a side-firing 250mm long-throw bass driver and a complementing 250mm ABR.